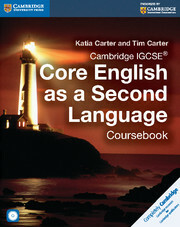 The Cambridge Core IGCSE® English as a Second Language series helps Core level students perform to the best of their ability. 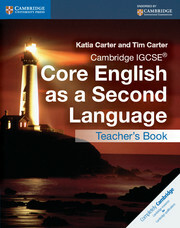 Cambridge IGCSE® Core English as a Second Language series has a strong focus on contextualised grammar and vocabulary and will help students who want to succeed at Core IGCSE level. The Coursebook includes productive stages called ‘Activate your English’ which are project sections where students can practise their English in communication activities. Exam-style questions allow students to practise their English and an audio CD is included for use with the listening exercises. The Teacher's Book provides invaluable advice and tips for teachers from experienced authors, in addition to the answers to all of the Coursebook questions. Topics and activities which have been tried and tested in the classroom. Project work to expand the language acquired and contextualise the learning. Study tips, key term boxes and Did you know..? boxes with interesting facts related to the topics. Self-assessment for learners in the form of quizzes throughout the series. Communicative activities to practise the language in context. Examples of real English to give students real life scenarios. Audio CD for use with the listening exercises.